All slides from Taser CEO Rick Smith’s 2014 Shareholder Presentation. In the wake of the fatal shooting of Michael Brown by Darren Wilson last August, a growing chorus of police officials, police unions, legislators and civil rights organizations have advocated for body cameras as an instrument for reform. This unlikely consensus has been held together by the hope that video evidence might increase transparency and accountability for the police and public alike. Police departments across the country—from the NYPD to the LAPD—have responded to these calls by spending handsomely to outfit their officers with body cameras. In May, the Department of Justice launched a $20 million dollar program to help local departments across the country with funding these efforts—the first chunk of a quarter of a billion dollar reform program requested from Congress by President Obama in December. The cameras are not cheap, ranging in price from $800 to $1,000 per unit. But the real money lies in monthly data storage fees. Taser International has quickly become the market leader for storing and managing video evidence in the cloud through its business division Axon. 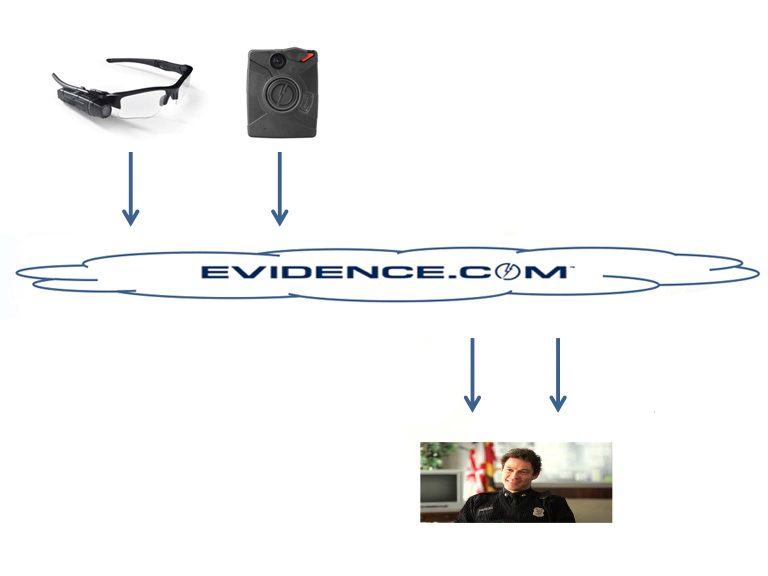 Taser’s software and storage brand, ­Evidence.com, promises to collect and share digital evidence. But keeping data in this evidence cloud costs $15 to $55 per officer per month, which translates annually into hundreds of thousands of dollars per ­department—sums that a decrease in lawsuits against a police department is not sure to offset. But so far the real trick is making sure the 21st century mindset looks exactly like the last’s, with Taser continuing to profit from police violence. In an open letter to shareholders, Taser founder and CEO Rick Smith compares the 20th century’s adoption of the Taser gun to today’s push for body cameras. The last company to revolutionize law enforcement was TASER International…The next company to revolutionize law enforcement will be TASER International…We see several similarities to our market entry with TASER® weapons over a decade ago when looking at the video market. His comparison is no coincidence: the market for filming cops, like the market for shooting people with Taser guns, was greased by calls for police reforms—including those seeking to curb the police’s misuse of Taser’s weapons. But although the Taser gun and the body camera emerged from desires to rethink American policing, they have been marketed to departments as tools to help them avoid lawsuits and make policing safer for the police. Both also happen to be ineffective: Taser has been repeatedly sued for wrongful deaths attributed to its allegedly non-lethal Tasers, while footage collected from its police-worn body cameras has rarely been used to indict an officer. When viewed in the flickering shadow of the stun gun, body cameras appear as simply the latest untested devices to be sold by a corporation that has long co-opted activist calls for police reform. Unsurprisingly, Taser entered the body camera business out of a need to protect its high-voltage shock weapons and the police departments that use them from lawsuits. The first iteration of body cameras were the ones Taser put on their stun guns. The gun’s camera would activate automatically whenever it fired—sometimes up to 50,000 volts. As of September 1 this year, thirty-nine people have been killed by police and corrections officers using Taser guns. A study by the New York Civil Liberties Union in 2011 documented nearly 900 encounters with the weapon in New York state, finding that departments abused Tasers in 60 percent of reported incidents. 15 percent of those episodes took place after police had already subdued, restrained, or handcuffed their target. It’s not difficult to draw a line between fatal police shootings and the use of Taser guns. Walter Scott’s murderer, the officer Michael Slager, faces three lawsuits for prior incidents involving his abuse of a Taser. According to records obtained by the Post and Courier, Slager fired his Taser at suspects at least 12 times throughout his police career—six of which were in the year leading up to Scott’s shooting. The officer who shot the unarmed Oscar Grant in a train station in Oakland claimed in his defense to have mistaken his gun for his Taser. A Vice investigation in August reveals at least 10 other instances where officers have made this claim in the past decade. The Chicago-based grassroots anti-police violence group We Charge Genocide (WCG) was founded in response to the killing of Dominique “Damo” Franklin. Damo, a mutual friend of some of the group’s organizers, was tased twice, after which he hit his head on a light post, went into a coma, and later passed away. These persistent tragedies make clear that tasing people as an alternative to violent force hasn’t gone as planned. Perhaps this is because Taser guns, like body cameras, were implemented without actually knowing whether they would work. The most famous study involving body ­cameras—and the world’s only randomized-controlled trial on the subject to date—was partly funded by ­Taser International. The report concentrated on the small city of Rialto, California, and was co-authored by Dr. Barak Ariel, a criminologist at Cambridge, and Tony Farrar, an executive fellow at the Police Foundation and Rialto’s chief of police. Despite the authors’ statements that their findings are not generalizable, Taser frequently cites the study’s more promising findings as proof of their product’s efficacy. Nearly every article written about body cameras cites the finding that after body cameras were introduced, officers’ use of force fell by nearly 60 percent and complaints against officers fell by nearly 90 percent. But upon closer inspection, the report also reveals that for seven months out of 13-month trial run, use of force rates were nearly indistinguishable from those before cameras were introduced. One month even shows a higher use of force rate for officers wearing cameras. A three-month Fusion investigation corroborates White’s conclusions. Reporters reviewing records from five police departments with body camera programs found little evidence in favor of the narrative that police body cameras reduced use of force encounters. In fact, according to Fusion’s analysis, the number of ­police-involved shootings by the Albuquerque Police Department actually increased compared with the six years before the cameras were introduced. As with cameras, so too with stun guns. In 2011, cardiologists at University of California, San Francisco, uncovered “significant bias” in studies of Taser guns, which they attributed to close ties between the corporation and those who study Taser-related safety. In 2005 and 2006, the Securities and Exchange Commission investigated the company’s dubious claims about stun gun safety. They didn’t end up taking action, but stock value plummeted as orders slowed. Soon, body cameras were being pitched as the cure. Researchers remain unclear as to how the cameras actually work. It’s yet to be determined whether they have a chilling effect on the officer’s behavior, subject’s behavior, or both. They also don’t know whether these perceived effects would wear off over time. But this hasn’t stopped law enforcement agencies from entering into long-term contracts for toys whose efficacy has yet to be proven. Some of the ways in which Taser has gotten contracts also raise ethical questions. Taser and other suppliers often lobby for the company’s cameras to be donated to police departments through private charities and foundations, which allows them to sidestep competitive bidding and the scrutiny of a public vote. As the Associated Press reported in February, Taser International secured lucrative no-bid contracts to equip officers with cameras through a “troubling pattern” of cultivating financial ties to police departments. In New Mexico, the company gave consulting work to Albuquerque’s former police chief weeks after he retired. In Los Angeles, Taser International was selected to supply cameras with a no-bid contract after donating over $84,000 to the police foundation and the department over three years. If purchased with public funding rather than through these police foundations, Taser cameras might have been subject to greater scrutiny, and possibly a vote. Once the cameras are bought, the separation of corporation and department becomes even hazier. Because the majority of the data storage is set up to be handled by private services such as Taser’s own ­Evidence.com, it’s possible there will be little independent oversight of the data, rendering the cameras virtually useless in maintaining even the weakest vision of accountability. In contrast to the strict controls that have been developed by departments over time to store material evidence, Evidence.com seems to be developing its policy alongside its technology. Both Taser and Vievu told the Daily Beast that videos couldn’t be altered before being uploaded to company servers, but the amount of time that footage is stored is up to the discretion, or written policy, of each individual department. For departments that have made their protocols and standards explicit, this is usually between one and six months, depending on whether the video has been flagged due to an internal investigation or a citizen complaint, in which case, it will be saved for longer. These dull decisions about data storage raise ethical, in addition to financial, questions: Should all encounters be recorded? Should all of that footage be stored? Who decides when and how recordings are deleted, accessed, shared? So far, answers to these questions have largely been outpacing experts, lawmakers and public opinion, but whoever attempts to answer them has the power to alter not just the camera’s function or police technicalities, but the course of justice. The Mesa Arizona Police Department, for instance, found that allowing officers to activate their cameras resulted in nearly half as many video files being generated per month—simultaneously cutting costs and undercutting accountability. Privacy risks also emerge when storing evidence with third party vendors—mainly, the possibility for disclosure to other federal law enforcement agencies, security vulnerabilities, and the misuse of both data and metadata for third party mining. A representative from Evidence.com told the Daily Beast that the company runs some analytics on the data but does not have direct access. However, the representative declined to answer whether Taser will directly give federal agencies access to this evidence, circumventing legal procedures for sharing information. Fusion centers, which already enable federal, local and state law enforcement agencies to collaborate, could undermine any attempts to impose limits on who sees footage at a local or state level. (Taser, like the CIA, has partnered with Amazon Web Services to store their massive cloud). “With new technologies,” one Taser ad promises, “truth will rise.” But it’s likely that once it does, it will evaporate in the cloud. Because many policies instituted by departments and legislators limit the public’s access to footage, the “truth” is unlikely to drift too far. Police departments have long tried to predict singular episodes of crime through general patterns and data. The real advantage of police-worn cameras is not their powers to record individual instances of control or transgression, but the contributions of the data from these instances to the perpetually ineffective programs of predictive policing. The value of body cam footage, at least to the coffers of the private corporations storing it, depends not on any individual episode of police or civilian violence but in the aggregate sum of information recorded. The truth, for both Taser and the police departments it partners with, lies in the totality of its general collection. Police-worn cameras instantiate the “collect it all” ethos of the NSA in the body of the policeman: by collecting it all into the surveillance dragnet, he can now also criminalize it all. Body cameras will add more data to the predatory policing tactics that disproportionately target black and brown people. There are no laws preventing footage captured by cameras from being be used as evidence in criminal trials, warrant for suspicion, or justification for stops and searches. In its purest form, video captured from the police perspective serves as a threat—­especially for those with outstanding warrants or lack of documentation. The extent of the camera’s surveillance powers will, ironically, affect the police as well. Although in some cases cameras may curb police abuse, they will also give police less leeway to turn a blind eye to minor offenses, especially if their supervisors review the footage. Even experts supportive of cameras have commented on the potential for police to issue more tickets when citizens are caught violating ordinances or laws on camera. A study in Mesa, Arizona found that officers wearing cameras issued 23.1 percent more citations than those not wearing them. Cameras may also exacerbate these “taxation by citation” policing practices through their hefty cost. The St. Louis Police Department, for instance, has said that it was hoping to fund its program partially through ticketing fees. It’s safe to assume this means more tickets. Some privacy experts anticipate a camera-ridden world in which every jaywalk inevitably leads to an arrest. But rather than militarizing cops with expensive equipment from a corrupt corporation, we would be better served investing in training citizens to film the police, strengthening protections for cop watch volunteers and putting any cop camera footage in community control. Axon boasts that its “hardware and software solutions rival the best of Silicon Valley, but they’re built specifically for law enforcement.” This description of police departments as kinds of technology companies is deliberate. The company’s Seattle headquarters feature conference rooms named after famous technologists, like Ada Lovelace, Alan Turing, and Grace Hopper. There’s even a requisite ping-pong table. “Some of us are former cops. Some of us cut our teeth at companies like Google and Microsoft. Some of us graduated from Ivy league schools with liberal arts degrees,” Axon’s description continues. The implicit message: together, as a private collaboration of elite knowledge workers, we will “pivot” American policing. Notably, the promotional video for Axon is deceptively abstracted from its high-tech products’ function. It is, instead, a glossy series of images celebrating the labor of the creative class—as enticing a lure for future employees as it is a sell to police departments. A draftsman sketches by hand an Axon body camera and the Axon logo in a brightly clean basement; two relatively hip men design software for the Axon; hands take apart a charging dock; people draw happily on a see-through whiteboard. Interspersed with these images are short second-long scenes of faceless cops using the products—yet noticeably alone and with anonymized faces. They are far from the streets, not doing anything that could be considered remotely violent, threatening, or police-like. The words police, in fact, do not appear once. Instead, “We Think Big” and other bland mantras about innovative design pepper these cuts. This could just as easily be an ad for the latest Windows software, which is the point. Axon is Dropbox for cops, Snapchat for Minority Report, Facebook’s Big Brother. ­Taser’s business arm acts as a startup, seeing in current demands for police reform yet another lucrative market to disrupt. Originally published by The New Inquiry.